Following yesterday’s charms preview for the upcoming Pandora Spring 2014 Collection, today we take a look at the other jewelry included in this release. As mentioned before, the new collection dubbed Spring Takes Flight will official debut on March 13th and includes a number of nature and hobby themed beads. 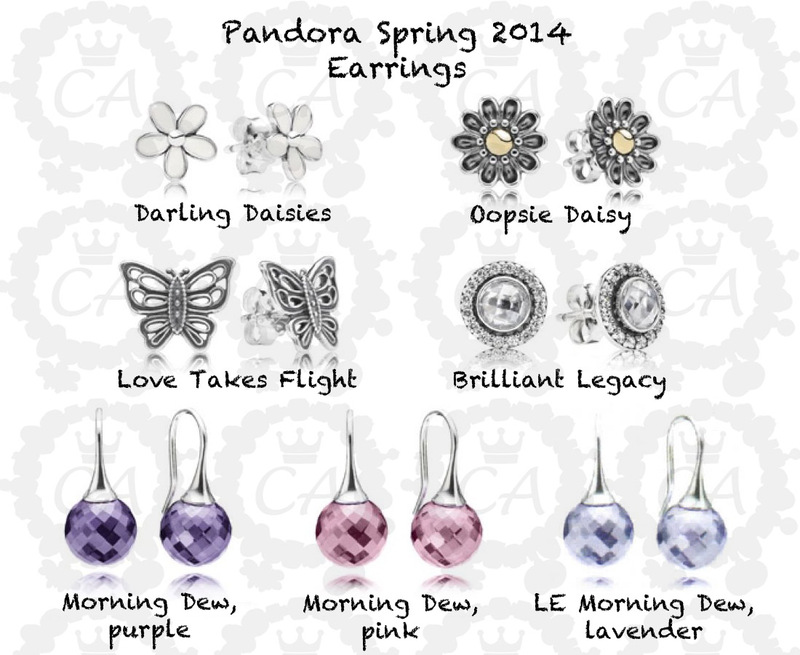 The jewelry collection echoes this theme and Pandora will be coming out with a fair amount of matching designs. There are flowers of course, and more generic pieces that are versatile for stacking. The Oopsie Daisy, Darling Daisy, and Morning Dew all have matching charms in this new collection and from last year as well. There are two multi-strand bracelets coming out, in lavender and pink, that are limited editions. I don’t have any additional details on how limited it is, but it’s safe to say that it won’t be a permanent part of the line. These bracelets only come in three sizes: 17 cm, 19 cm, and 20 cm. That concludes the Pandora Spring 2014 preview! Are you a fan of their jewelry pieces? Will you be getting any of these? Wow this might be the first time I’ll be considering other jewelry than the beads! Now I’m wishing those prices will be acceptable for my budget. 🙂 Thanks for this one!!!! That’s great! What pieces do you have your eye on? 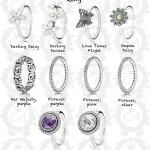 The Forever rings, the Brilliant Legacy rings and especially the Morning Dew earrings!!! This is underwhelming after the amazing releases last year…the hidden romance jewelry, feather jewelry, and vintage allure collection. These pieces look almost a little “childish”/teenage to me. My thoughts exactly when I saw these. Not a lot of selection, I agree. 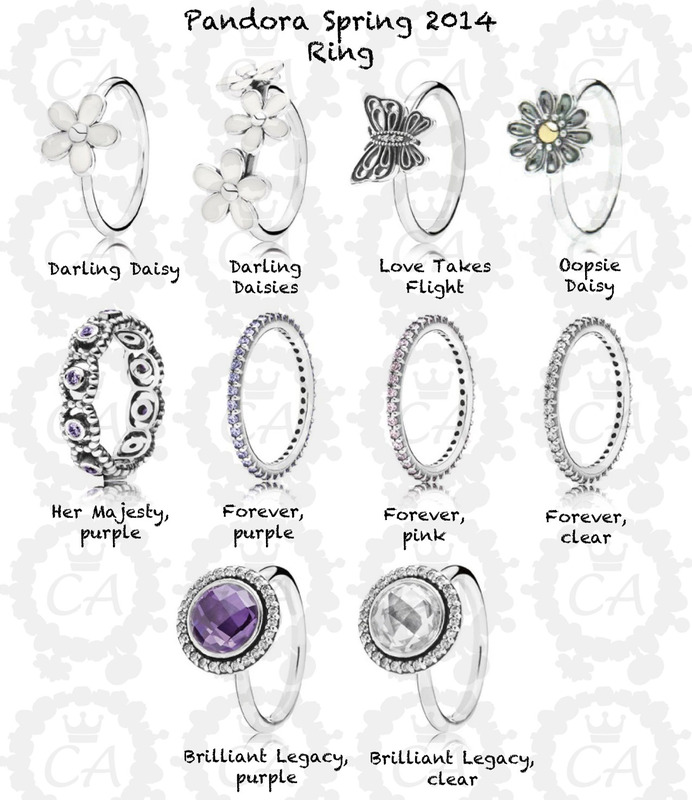 I do love the daisy rings though. I’ll probably end up getting both :). I just dyed my hair pink and lavender, I’ll be needing thosevstring bracelets, hope we get them in the uk. I’m sure they’ll get them! They’ll match your hair perfectly ;). I agree with Laura Summers………a bit too young. In fact the both the valentines and spring collection are aimed at younger people I feel. I think the strand bracelets are nice looking. I’m favoring less-full bracelets layered together and think this will be a great look for spring! I got a couple of the black and I like them! I don’t wear anything on them, but they’re very comfortable and layer really well. Hi there! Thanks so much for all the sneak peeks – in the larger picture with the flowers, there seems to be a pink Brilliant Legacy ring but it’s not in the listing – is this because it’s a Mother’s Day release? Also loving those morning dew pieces although not a huge fan of the LE colour so lucky me! I’m a very pink and purple girl so loving these new releases but can see how they’d not suit everyone’s taste. The soft pink multi-strand is on the top of my Wishlist! The soft pink multi-strand bracelet is on the top of my Wish List! I’ve got no info on the limited editions, might be around for a little while? I think they’re exactly like the teal triple wrap bracelet :). I’m a fan of their rings and earrings, so you won’t be disappointed! It’ll give you more time to save up ;). This may be early to ask, but does anyone have an idea if there will be a free bracelet promo in March in Canada/US? 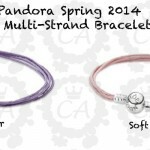 In 2013 Pandora did one and it seemed to be the weekend following the intro of the Spring collection. 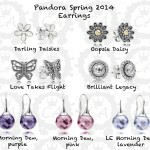 Pandora first quarter promotions have been updated on the blog. It’s under Lists in the main menu.